The mysteries of the yew are ‘discovered’ in stages that can be described as initiatory owing to the fact that they ignite quite dramatic changes in consciousness and in the way we use our senses and experience our bodies. 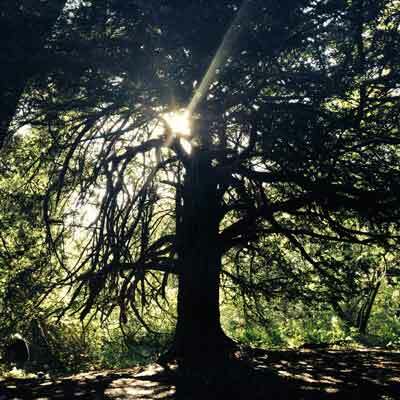 Yewshamanism appears and functions differently depending upon the particular qualities of the Yew Mysteries that a student has been led to incarnate at a given stage. Each stage begins to open a dynamic awareness of the yew as a higher intelligence able to preserve and reflect the memory of the emergence of the Earth from a purely spiritual state. The yew retains not only the memory, but a portion of the creative power of the forces that birthed the Earth out of Spirit. This is perhaps the key to the secret of the yew’s longevity and uncanny healing abilities. Based on my nine years experience under a female yew tree in Scotland I believe that this points to the original experience behind the early Hittite word for yew, Eya which means to ‘to be touched by eternity.’ To be literally 'touched by eternity' through the yew is to be in contact with the spiritual forces (of eternity) that shaped the Earth and all earthly beings. These secrets were known and guarded by the early initiates of the Yew Mysteries long before they were hijacked, humanized and Christianized. I have been able to outline several fundamental stages within the Yew Mysteries that a student of the yew might pass through with sufficient time, practice and dedication. These stages are not necessarily encountered in a linear sequence. I have listed five of them here. There are many more. Within each of these stages I have highlighted specific yewshamanic skills in healing and seership that I was called to embody. I have been teaching these skills for over ten years. Further details of these stages including the specific methods of perceptual orientation, the potential healing applications and how these are related to the yew are only given in the Yew Mysteries trainings.